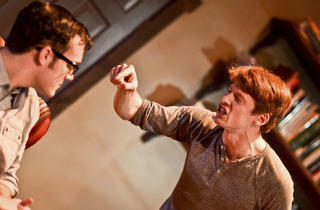 Lucas Neff’s deft, tense two-hander gets two strong premieres in an alternating-cast production. Late one night in a remote cabin alongside a man-made lake—currently drained for dredging, we’re repeatedly told—a tightly wound writer named Royall prepares to receive a visitor. Royall, who tells us in an opening monologue that “my love” has recently left him, has a bit of an obsession with ideas of purity and morality. Those notions come into play in conversation with his visitor, Gerry, an actor in a career slump looking to sublet the house. As their interview wends and weaves, fueled by plenty of whiskey, it becomes clear we’re watching a game of cat and mouse. Where the titular duck comes in, however, remains elusive until the play’s climax. 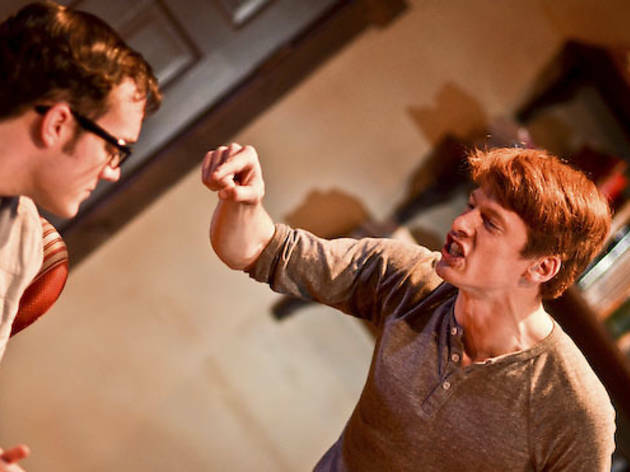 Lucas Neff, the Chicago-born actor starring on the Fox sitcom Raising Hope, demonstrates a deftness with dialogue and story in his first produced play. There are some problems: The use of direct address in the opening scene feels too facile a choice, and Gerry’s rant about critics is a bit indulgent. Still, this is a tightly plotted comic thriller with a tense culmination. Marti Lyons helms a well-appointed and smartly paced production—or productions. Neff stipulates that the two actors alternate roles nightly; Lyons and her talented cast make the dual iterations seem quite distinct, with Andrew Burden Swanson and Pat Whalen clearly distinguishing their characterizations. Though both casts are compelling, the teaming of Swanson’s coolly sociopathic, Patrick Bateman–esque Royall and Whalen’s affable, regular-joe Gerry is slightly more successful.